The reflection you see is deceiving. The imprint you leave so haunting. 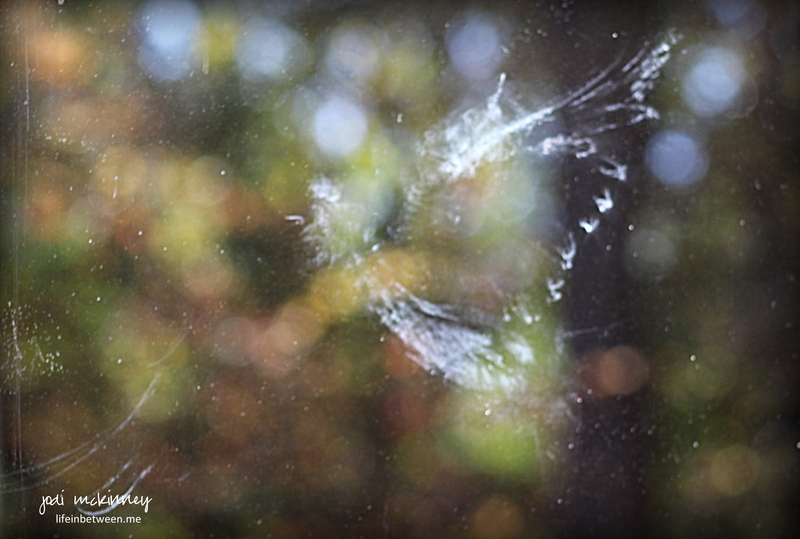 This photo is of a window in our breakfast nook where a bird recently hit, but survived (as far as we know). Oh, I love this post so much. The imprint on the glass is beautiful. It is quite amazing – eh? Thanks, Sylvia! True…the imprint is beautiful- a definite reminder of the fragility of life. This unfortunate thing happened with a fatal outcome on my daughter’s bathroom window on the third floor of our Pittsburgh condo that is unaccessible for me to clean. It does haunt me when I see it…your photo is amazing. Or you Don’t like washing Windows!!! I love this! That happens so many times but this time yes it looks like angel wings and a symbol!! you see art every where Jodi! Thanks Lynn! It is haunting and beautiful all at once – eh? good way to describe it! hmmmmm… you certainly have me thinking…. Beautiful words and photography. Thanks for sharing this very poingant moment in time, Jodi. The bird left an amazing image – almost a perfect outline of its body and wings. I’m glad to know the bird survived. The image is beautiful and so was your poem. I wonder what that white is? It’s almost as though the little bird was covered in white paint. That’s a fantastic photo!! Love hearing what you see in it! It does seem like angel wings. It does look like angel wings to me ~ beautiful photo! It always bothers me to hear that sound. Life is fragile, indeed. This really is a fabulous photo, Jodi. Both the bird forum at About.com and American Bird Conservancy have lots of tips on methods that do and don’t work for keeping birds from hitting windows. Love your poem! Goodness! It’s heart in your mouth beautiful! your poem partnered the image magnificently Jodi. I felt quite sad, I always do when some small creature gets hurt. I’ve gotten very soft as I’ve gotten older! Love the phrase – a reminder of the fragility of life. It bears a bit of contemplation on 🙂 Very touching post. that is so kind of you, Deb! Thank you! Oh Jodi, such a beautiful post. I think everyone’s comments are so spot on! Thank you for sharing this and the mention of how fragile life is.